There are a wide range of job opportunities available in the automobile industry. With the number of vehicles available on the road today, the need and requirement for people who can fix these machines is fast increasing. Careers like automobile technician, car or bike mechanics are a great option. According to the Confederation of Indian Industry, the automobile sector currently employs over 80 lac people. An extension in production in the automobile industry is forecasted, it is likely to rise to Rs. 600000 crore by 2016. With the increase in production of automotive sector, there will also be increase in demand of Skilled Mechanics in the industry. “Skilled Manpower” refers to a trained person not only technically but who can adapt and work in the industry environment from the first day of work. 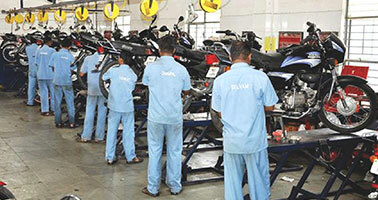 To increase productivity and to update the technology of existing work force, Lok Bharti assures that re/ up- skilling short term programs are conducted for road side mechanics .The same has also been conducted under the flagship of “STAR Project” wherein the workers were also assessed & certified, thus making them understand the benefits of skilling & certification.